Four New Releases and a Free Short Story! Our new releases for you this week include a steaming hot sci-fi from Jane Henry, an excellent Victorian title from Lily Harlem, an extra-spicy contemporary romance from Morganna Williams, and a thoroughly naughty short story from Emily Tilton which is available for free on Amazon through the end of Wednesday. The final section of Claimed on the Frontier is now up as well, so make sure to finish the book while it is still available for free. 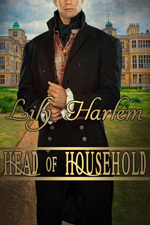 Publisher’s Note: Head of Household contains spankings and sexual scenes. If such material offends you, please don’t buy this book. He is a barbarian. A savage. I came to his world as a spy… and I was caught. Alone and defenseless, my fate is in his hands. He captured me, punished me, and claimed me as his mate. I promised myself that I would never yield, that I would resist and escape, but as he trains me to serve him I begin to wonder if one day I will gladly call him my master. When I saw the little one in our midst, I was drawn to her beauty. She broke our laws and must pay the price, but I will let no harm come to her. She will belong to me, mine to enjoy as I please, and soon she will know the pleasure of surrendering to a warrior’s mastery of her body. Publisher’s Note: Aldric: A Sci-Fi Warrior Romance includes spankings and sexual scenes. If such material offends you, please don’t buy this book. After she is caught in the midst of a scandalous indiscretion, eighteen-year-old Ginevra Audley is soundly birched in front of her finishing school classmates and then brought to Dr. Reginald Brown for further correction. She is made to strip completely and display herself shamefully before the stern doctor, and when she is disobedient during the intimate, humiliating examination, Ginevra is punished in the most embarrassing of ways. Once Dr. Brown is finished with her, Ginerva is handed over to a handsome young gentleman who will train her thoroughly and then take her as his bride. Publisher’s Note: Examined and Corrected is the sixth entry in the Victorian Correction series. It is a short story which includes spankings and sexual scenes. If such material offends you, please don’t buy this book. New! Read Chapters 10-11 and the Epilogue! Did you miss Chapters 7-9? You can find them in March 20th's Newsletter. Loki Renard's latest book, The Alien's Leash, has taken a spot in the Top 100 for Amazon's Science Fiction Romance category! Congratulations Loki! Ava Sinclair's new book, The Sheriff's Secret Baby, has reached the Top 100 in Amazon's Western Romance category! Congratulations Ava!